The MeasureReady™ 155 Precision I/V Source is now shipping. ORDER NOW. Low noise, high precision combination current source and voltage source that is as easy to use as your smartphone. 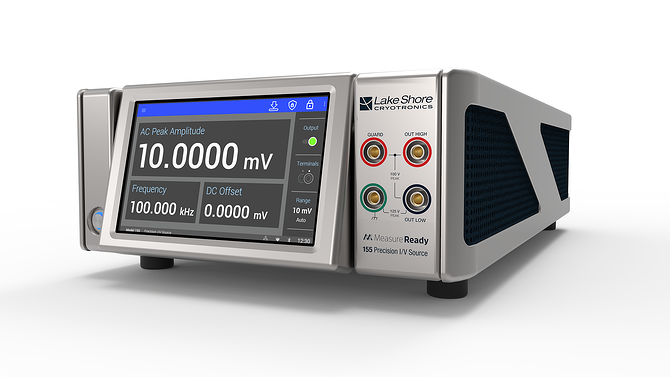 Lake Shore's all-new combination current source and voltage source combines premium performance with unprecedented simplicity and intuitive operation. The 155 features clean (low-noise) excitation, an uncluttered touchscreen display, and full connectivity with a mobile app for remote monitoring. Built for science. Designed for people. Review the specs to see if the 155 will fit into your lab.